Back in October TBF announced a massive expansion with its new National Semi-Final program. It is original, fresh, bold major expansion and much needed focus to the TBF adult program that allows MANY more Adult Club members 16 years of age and older to participate, close to home! The feedback so far has been GREAT! We promised more details to come so here are some of them! Ponca City, Ok. (October 23, 2015) - The Bass Federation (TBF) announced today that it is expanding the adult qualifying program from seven TBF division championships to a TBF National Semi-Finals Program comprised of more than 20 “close-to-home” events. “It is time,” was the theme heard throughout the 2015 state presidents’ conferences, which were held in conjunction with the Forrest Wood Cup in August in Hot Springs, Ark. The 2016 season will mark the final year the long-established TBF framework of seven division championships will serve as the process by which anglers qualify nationwide into the biggest events with the largest prizes in all of competitive fishing. It will be replaced by a massive expansion of more than 20 TBF National Semi-Final events. Both programs (the division championships and the new National Semi-Final events) will run concurrently for the 2016 transition year so that no one is left out. The basic structure of TBF’s current adult program was voted into place in 1990 by the state federation presidents. It has served the federation well for 25 years. The first hurdle in making such a major change is getting all state presidents to agree on a basic outline and then working through all the details to roll it out. When the presidents work through this, it’s a pretty good vetting system and the new concept outline was voted into place unanimously by all states attending TBF’s 2015 annual meetings. • All National Semi-Final events will take place in two- and three-state groups, so travel will only be “next door”. This means not only is travel costs greatly reduced and payouts greatly increased but the new program will host a National Semi-Final event in every market segment of North America. • Anglers want to fish for some money, so that will be a huge added feature. • This program greatly reduces the amount of time required to qualify and advance. 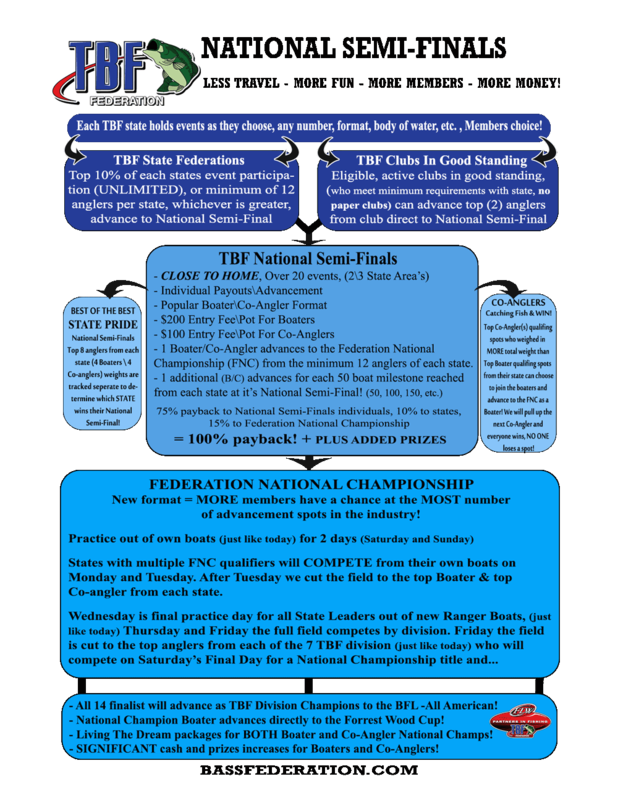 • In a giant new club benefit for every individual TBF affiliated club in good standing with their state, they will have the ability to qualify their top angler(s) direct from their club to a TBF National Semi-Final. 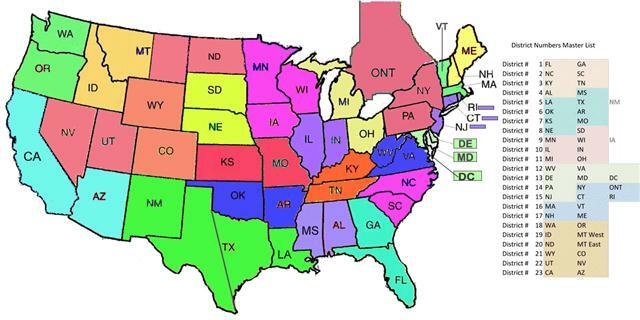 • Larger membership states will qualify more anglers to a National Semi-Final because they have more members competing. Each state federation will send a minimum of 12 anglers to a National Semi Finals, there is no maximum based on membership participation and growth. • MORE anglers from each state will also advance to the TBF Federation National Championship. For instance at the 2017 Federation National Championship at least 2 boaters and 2 co-anglers from each state. Depending on participation numbers, some states may advance even MORE. • State Pride – The program will continue a new “State vs State Competition” piece within each National Semi-Final where a percentage of top qualifying anglers will represent their home state with significant prizes and bragging rights for the state who wins their National Semi- Final. • All payouts will increase significantly across the board however a major emphasis and rewards are being added for those members qualifying as a co-angler in each National Semi-Final and in the Federation National Championship. • Full details and outlines will go out to the state Federation Presidents & membership in coming days and weeks and be posted to bassfederation.com as the new program is rolled out. The Bass Federation Inc., (TBF) is owned by those we serve and dedicated to the sport of fishing and proudly “partners in fishing” with FLW. TBF is a member of the Fresh Water Fishing Hall of Fame and the only 100% member-owned national fishing organization. TBF is the largest and oldest organized grassroots fishing, youth and conservation organization in North America. TBF-affiliated state federations and their member clubs conduct more than 20,000 fishing, youth and conservation events each year. 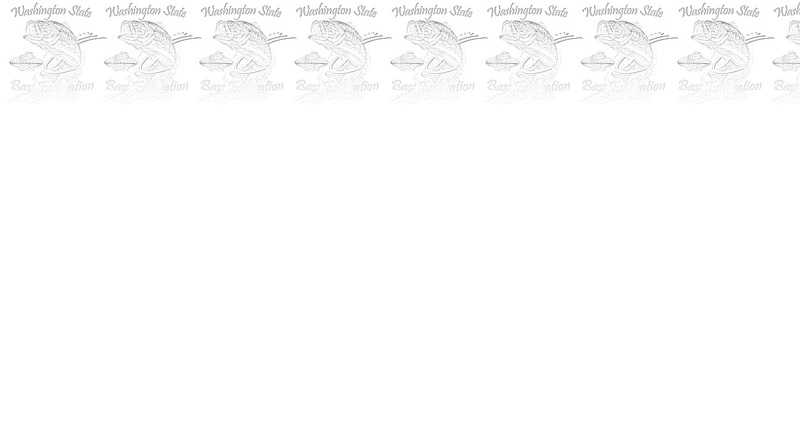 The Federation has provided a foundation for the entire bass fishing industry for more than 45 years. For more information about TBF visit Bassfederation.com or look for bassfederation on Facebook. Attached below is the DRAFT of the Map for the 23 NEW TBF Districts, all of which will host a TBF National Semi-Final event, everyone is paired with a neighbor to fish against in a close to home TBF National Semi Final Championship event. ALL entry fees are 100++% payback each season and MORE! Still 14 anglers advance to the BFL All-American, The TBF National Champion still advances to the Forrest Wood Cup! Boater and Co-angler Living the Dream packages and MUCH MORE!